A swing is defined as a price move in a particular one direction. 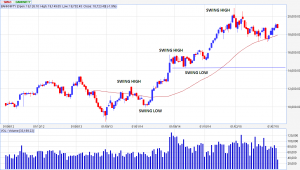 Swing trading deals with riding the move of a particular swing whether up or down. This strategy basically deals with the larger trend in the financial instrument. As it is often said “Trend is your friend”. This strategy let the traders to be with the trend and ride that particular trend. There are two to three terms which we will be using frequently in this article to understand the concept. This is the basic concept which every trader should know. Majority of the trading strategies are based on this particular concept. Even, most of the automated trading systems take swings as the basis to design a system and for which they sell these for thousands/millions to the unknown traders. We will try to show this concept with the help of the below chart. 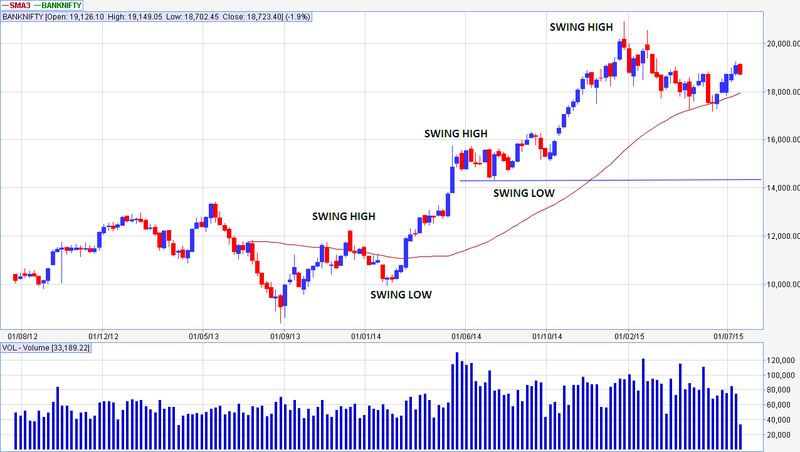 In this weekly chart of Bank Nifty, the swing highs and lows are mentioned. As and when the first swing high is taken out we are confirmed with the uptrend and can take buy orders with the recent swing low as stop losses. As this is a weekly chart, so stop losses would be very big. Traders can use shorter time-frame charts to use the same strategy. The current situation suggests the long term trends are still positive for the above chart. Till the time 14300 are not taken out, one can enter into buy trades with 14300 as stop losses. This is not a recommendation but to understand the concept. When we study the daily charts of Bank Nifty it is in a corrective phase. So whenever correction may end it may try to come near those levels but might not break 14300. A break of 14300 will break the uptrend and then upside corrections will come but trend would have changed. To conclude, it is trend based strategy where it lets traders to remain with the trend and earn big chunks.